Zoink, an award winning development studio located in Sweden, have primarily focused their skills for the mobile market with titles like 'Adventure Time: Rock Bandits', 'Swing King', and 'Reality Fighters Dojo' for iOS and Android. And yet, they managed to branch out to the console spectrum with the recent 'Stick it to the Man!' and thereby broadened their footprint with platforms like the PlayStation 3, PS Vita, Wii U, PC, Mac and now, the PS4. 'Stick it to the Man!' appears on its surface to be taking visual cues from games like 'LittleBigPlanet' and 'Tearaway,' but at the same time appears to reflect a whole different avenue of humor, not to mention gameplay. Sounds intriguing, but does the gameplay and story provide enough creativity to seal the deal? It's only fair that I'm honest and up front with you. 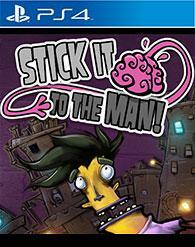 Trying to describe and classify a game like 'Stick it to the Man!' is more than a little daunting. At its heart, it's a side scrolling platformer, but the theme and story of the game go so much deeper – like Freud and Jung on hallucinogens deep. Consequently, the result is one of the more creative, original, and enjoyable games I've had the pleasure of experiencing in recent memory. The game begins with Ray, a hardhat tester who, ironically, is struck on the head by a canister that has fallen from a passing aircraft. The creature that crawls out from the canister and takes up residence in Ray's brain provides him with the ability to read minds through the use of a strange neon-lit arm that protrudes from the top of his head. Of course this new appendage can only be seen by Ray, and the power that it wields delivers a story that is a mix of Terry Gilliam style odd and Mel Brooks style funny. While 'Stick it to the Man!' is based on the fundamentals of a side-scrolling platformer, these mechanics take a significant backseat to the more integral and interesting feature of character interaction through mind reading. Sticking your new hand to the heads of the characters you encounter allows you to read their thoughts. Doing so will often result in images (or stickers - think 'LittleBigPlanet') that can be pulled from the character's thought bubble and taken with you to help solve the problems and puzzles of other characters you will encounter. Is the guard that's hunting you in need of sleep? Take their sleep-deprived thoughts and slap them onto another, forcing them into a deep slumber. Has the abominable snowman become self-conscious of his bald spot? Maybe the recently lost hair from the zombie choir director will help out. While the solutions to these puzzles increase in complexity as the game progresses, they nevertheless continue to be creative and comical. The power of Ray's third arm isn't limited to mind reading alone. Like a child's sticky hand toy, it can be extended and attached to pins scattered throughout each level, propelling you to otherwise unreachable platforms. Creatively, the developers at Zoink have implemented this gameplay mechanic through the use of the DualShock 4's touch pad. Replicating a PC mouse or iPad touch screen, players can move a cursor on the screen and tap the pad to quickly attach Ray's hand. Although simplistic in theory, the application is often hit-or-miss. Where managing this from a PC mouse is likely an easy operation, the smaller touch pad of the DS4 results in the need for more strategic positioning of Ray's character – an option not always available when playing the game. While this was frequently a point of frustration – especially when running from the Men in Black hunters – it didn't necessarily ruin an otherwise fun and enjoyable game. 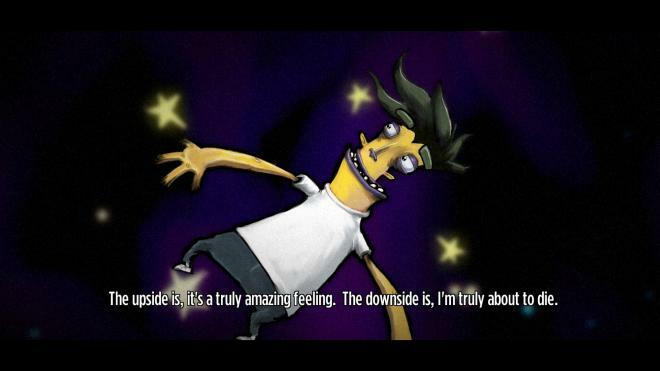 The developers at Zoink have created Ray and the world he inhabits from an imaginative use of paper and cardboard cutouts. 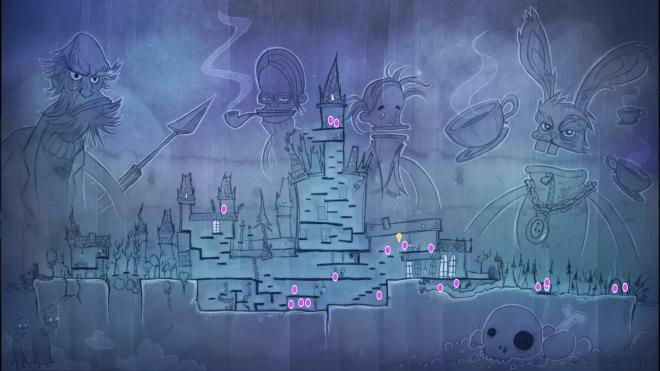 Both the animated and static characters and environments are superbly done and help to further immerse the player into this unusual world through a nice mix of colorful splashes and chalk- drawn outlines. I particularly enjoyed the head animations as characters spoke to one another. 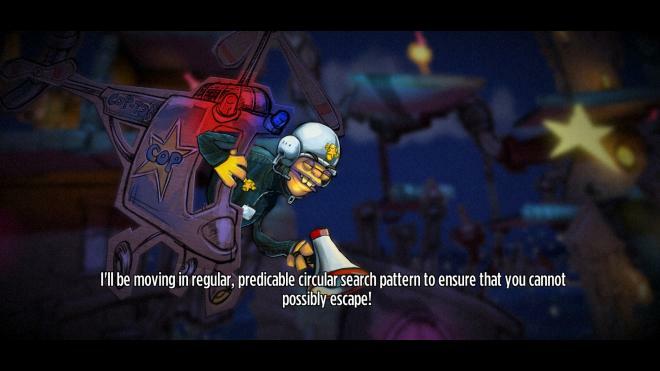 The complete separation of the top of the character's head from their bottom jaw enhanced the comical tone in an already cartoonish looking game. There is also a high level of variety between characters and environments from chapter to chapter. At one point, the player will be traversing Ray's brain. In another, you'll be searching for a way to escape from the inner walls of a mental hospital, populated with inmates that would give Arkham Asylum a run for its money. This level of variety helps to keep things fresh and interesting, and you'll look forward to what the game has to offer as the story progresses. When a video game like 'Stick it to the Man!' begins with the song 'Just Dropped In (To See What Condition My Condition Was In)', I can't help but smile and fondly reminisce about my favorite Coen Brothers movie - 'The Big Lebowski.' Considering the creative setting and unusual story of 'Stick it to the Man!,' this choice for opening song could not have been any more appropriate. Adding to this is some wonderful – and wonderfully funny – voice acting. Whether it's Ray detailing his odd and uncomfortable first kiss, or his psychiatrist apologizing for using the bathroom in Ray's head, the writing and subsequent delivery of the story from one character to the next is always spot on. During the brief four to five hours of gameplay I often found myself laughing out loud. Anyone with an open sense of humor will likely experience the same result. Zoink has also made creative use of the DualShock 4's internal speaker by reserving it for the thoughts Ray listens in on. The audio during these oft-repeated events is presented in a way similar to speaking from a distance through a tunnel. After adapting to this form of communication it quickly became second nature and another example of the developers successfully making the best use of the tools made available to them. Replaying a game like 'Stick it to the Man!' will likely be up to the individual and how much they enjoyed the story, characters, and unique environments. I would liken it to re-watching episodes from your favorite sitcom. You know the next punch line but can't help and laugh anyway. Eventually the comedy will wear thin, but initially you're more than happy to revisit old characters. With that said, and with 'Stick it to the Man!' now available across a variety of gaming platforms, it's also possible that the temptation to replay the game from a handheld or your PC might provide for a better or more intuitive experience; especially considering the occasional problem I had when controlling from the DualShock 4's touch pad. 'Stick it to the Man!' was undoubtedly a pleasant surprise for me. I was somewhat familiar with the game when it was first released but knew very little about what it had to offer. It's always a treat finding an indie game that unexpectedly provides a better overall experience than some of the AAA franchises the video game industry has to offer. 'Stick it to the Man!' is just such a game. While not the most challenging game available, it will entertain you in ways other game developers should take note of.